Later in June, lawyers rallying for and against Microsoft will present closing arguments in a proceeding that has the potential to radically change how the technology giant sells software. A federal judge would then deliberate about what sanctions she should impose against Microsoft in an attempt to prevent future anticompetitive business and technological practices that violate U.S. antitrust law. No matter what she does, nothing will likely undo the stupidity that got Microsoft into trouble in the first place. The company insists it has the right to integrate whatever technology it wants into Windows. That practice led to two trials, one still ongoing after—count `em—four years. But the practice Microsoft fiercely defends—almost as a God granted, religious right—is stupid. Microsoft has been busy integrating technologies into Windows that make no sense being there from a business perspective—and they actually make new PCs harder to sell and use. The right Microsoft defends and the way it has been used is just plan dumb—unless of course the objective is to protect the monopoly and not benefit consumers. That latter point is one reason why this case never seems to end. OK, lets recap the antitrust drama so far: Four years ago in May, the U.S. Department of Justice (DOJ) and 20 states filed a sweeping antitrust case against Microsoft, charging the company used its mighty Windows monopoly to squash upstart Netscape Communications. One state soon dropped out; another settled with Microsoft last year. In a stunning setback, in November 1999 and April 2000 rulings, a federal judge found Microsoft had committed about 20 different antitrust violations. In June 2000, he ordered Microsoft to be broken into separate operating systems and software applications companies. But he stayed the order pending appeal. A year later, a D.C. Court of Appeals upheld the core of the judge’s findings and 12 separate antitrust violations. Even one would be considered serious. But in their unanimous decision against Microsoft, the seven appellate judges threw out the breakup order, because the trial judge failed to give the company due process. The Court of Appeals also booted the judge from the case, for talking to the media behind closed doors during the trial. So last summer the case went back to the court and a new judge—with the appellate court busy giving ’em the boot, Microsoft’s third jurist since 1995. Then after the September 11 terrorist attacks on the World Trade Center and Pentagon, the new judge told all parties to settle up and get the case over with; it was the right thing to do under the circumstances and in the best interest of the U.S. economy, she said. Sure enough, the DOJ and Microsoft caught the 18 states off guard with an early November settlement. Nine states jumped on the settlement bandwagon, but nine others decided a fight to the death—even against a company with then about $36 billion in the bank—was preferable to capitulation. So in March, the case returned to court for a new proceeding on a remedy. Closing arguments commence June 19, after which the case’s new judge is expected to spend most of the summer crafting a new remedy. If the nine states get their way—and they mostly likely will not fully—Microsoft will have to sell a second version of Windows from which Web browsing, instant messaging, e-mail and media playback software can be removed by PC makers or consumers; give away for free the software blueprint to the Internet Explorer Web browser; and license through auction Microsoft Office for development by competitors for other operating systems. Not surprisingly, Microsoft’s fiercest competitors—among them, AOL Time Warner, Oracle and Sun—are the biggest cheerleaders for the states’ plan. Even if the judge grants the states’ request for that second version of Windows, Microsoft could continue its kitchen-sink approach with the main Windows. Dumb is dumb, but Microsoft is doing dumb dumber by bolting applications onto Windows. Bloat is the biggest reason. Web browsing, digital media, and other technologies sold separately by other companies (they’ve got good reasons for doing this) bloat the operating system. Maybe only a Microsoft coder would argue Windows is efficient; the bloat ensures Windows isn’t all that efficient at all. Bolting on those technologies serve up good-enough computing, but not much more. With its big, bloated Windows monopoly, Microsoft only has limited incentive to develop the technologies it tacks onto the operating system. But because the stuff is there—and for free—many people will just use what they got instead of paying for something else or something better. Microsoft integrated Internet Explorer into Windows in 1998, but the basic features haven’t changed that dramatically since. But IE’s inclusion makes it less likely for the majority of PC buyers to download alternatives, such as Mozilla, Netscape 7, or Opera 6. RealNetworks has a lot more incentive to do really good digital media technology than Microsoft, because that’s Real’s only business. But Microsoft’s integrating Windows Media Player into Windows XP hurts the alternative, even when RealPlayer software is included for free with new PCs. But the biggest problem with bundling: The technologies are hard to sell and their inclusion in the operating system is counter to current consumer computing buying trends. Some computing history is required to explain: During the first wave personal computing, people and businesses bought PCs for improved productivity. Bean counters and accountants loved what spreadsheets Microsoft Excel and Lotus 123 did, respectively, for the Macintosh or MS-DOS PCs. Graphic designers and would-be publishers went nuts over the Mac. WordStar and WordPerfect brought writing from the typewriter to the PC. People bought personal computers for the applications. The rise of the Internet kicked off the second big wave of PC buying, which coincidently coincided with the release of Windows 95. But like the first, that second wave exhausted. Just in time, a third wave has taken shape in deep waters. Now people are buying computers to do digital media—music, photos, movies, and DVDs—produced on cool gadgets. This third wave is about connecting things to PCs and doing cool things with their digital content. So you buy a digital camera, take some pictures and use the computer to capture, process, edit, share, and print the images. Songs can be stored digitally on the PC, burned onto CD that will play in a consumer player or offloaded to a portable player. Digital camcorders record video digitally that would-be-Spielbergs can transfer to a PC, edit and burn to a DVD grandma can watch on her home player. But bundling doesn’t make sense for this third wave of computing, because it makes the applications much harder to use with these devices. Worse, the features are much harder for PC makers or retailers to sell. Walk into a store and ask the CompUSA rep to explain Windows XP’s Scanner and Photo Wizard. “Say what?” Granted, you can do cool things with the tool, but it’s no way to sell a PC. To combat this OS bloat hoisted upon them, PC makers are adapting to emphasize the cool things their computers can do. Interestingly, Microsoft’s bolted on applications are rarely part of the equation. Sony serves up some of the best digital media PCs on the planet. But all the applications are Sony’s and most work tightly with the PC hardware for editing movies, managing or storing digital music, or recording TV shows and burning them to DVDs. Gateway’s approach is selling PCs specialized for function, such as music, movies, or photos. In fact, Gateway Country stores are now organized around these digital media tasks. Interestingly, Apple is doing right what Microsoft is doing wrong. Like Microsoft, Apple includes digital media applications with its operating system. But rather than bolting them on, Apple includes the applications separately. This strategy accomplishes the same goal Microsoft supposedly is trying to achieve—enhance the value of the OS—without adding the extra integration overhead. (Remember, some part of this stuff Microsoft tacks onto Windows is running in the background. Close Apple’s apps and system resources free up.) Apple’s strategy also is more in line with where the market is going. Back to the poor schlep hawking PCs at the CompUSA: Selling a consumer on the merits of Apple’s iPhoto, which is an easy-to-demonstrate separate—and I might add, very cool—application is a lot easier than explaining why the Scanner and Photo Wizard is a reason to buy a Windows XP PC. Hey, you don’t believe me? Go check out the store and see the digital media features at work. Apple’s stuff is cool, easier to demonstrate and no hard sell. That’s not saying Windows XP doesn’t do as well, or in some cases better. But bolted on applications are harder to explain. Take for example, one of Windows XP’s coolest digital media features. Microsoft changed the file system so as to recognize digital music. So in the details view, you can see artist, title, album, and other details just like you would name, file size, or date accessed for a Word document. That’s damn handy for music aficionados. But Apple’s iTunes, which serves up all the same information with the songs viewable in the application with ultra-easy ripping and burning, is easier to demonstrate and sell. Another example: My wife is using Apple’s 5GB iPod digital music player. To rip an album, she inserts a music CD into the Mac, which opens up iTunes. Without using a Wizard or going elsewhere, she can import from the main iTunes application. To sync up the iPod with the updated iTunes songs, all see has to do is plug the device into the computer. That’s it. The process is automatic. Other manufacturers’ music players require a couple more steps, but the process is still a lot easier than Windows Media Player for XP. Microsoft is a great technology company—about that I have no doubts. But bundling is a bungle. Separate applications are easier to demonstrate, sell and use, particularly in this third wave of computing. Strangely, Microsoft understands this problem and has worked out a solution of sorts. 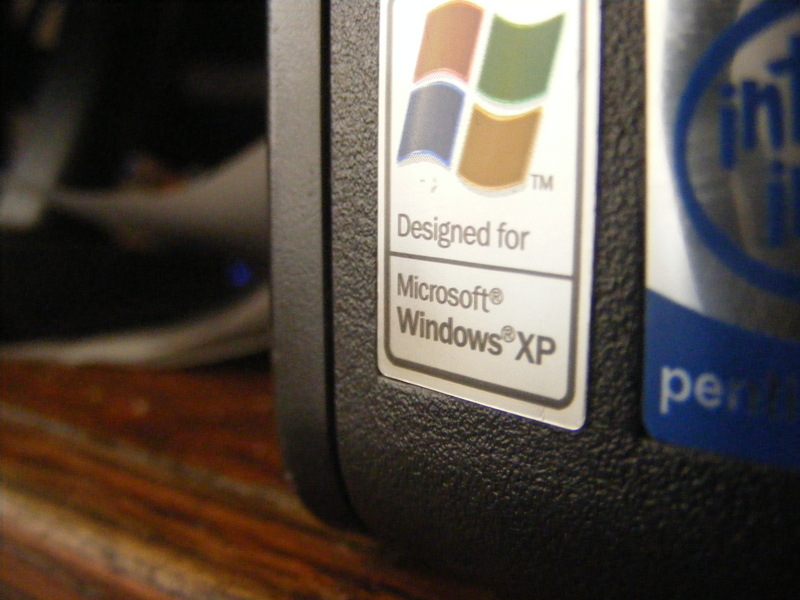 The company is developing Freestyle, a second user interface for Windows XP that taps directly into the photo, movie, music, DVD, and TV features of the OS. PC makers could then sell Freestyle PCs which serve up these digital media features via remote control; all the regular computing features would be there too. Good for Microsoft; that helps solve some of the “how do you sell it” problem. But how do I spell “more bloat?” F-r-e-e-s-t-y-l-e.
Editor’s Note: On July 31, 2017, this post was recovered, using Archive.org Wayback Machine, from a snapshot of joewilcox.com. Date is authentic.